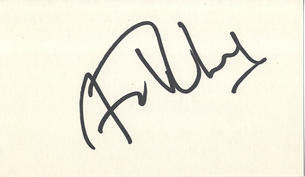 This is an In Person signed white card 5" x 3" by the Pakistani born British actor. Art Malik (born November 13, 1952) is a Pakistani-born British actor who achieved international fame in the 1980s through his starring and subsidiary roles in assorted British and Merchant-Ivory television serials and films. He is especially remembered as the doomed Hari Kumar in The Jewel in the Crown at the outset of his career.